If you’ve been following my blog for a while, you’ve seen me write time and time again about quilling tools. But, I’ve only written about the tools you really need to start quilling. I’ve never really dived into the less common tools. All those extras that you might not “need”, but they might make some processes easier or more efficient. Or maybe they’re just fun! So I decided that I would start a series where I play with some newer quilling tools. I’ll see how I like them or not. What works well and what you can just skip. This week, I’m testing out something I’ve been eyeing for a while now. I’m sharing a Border Buddy quilling tool review! The Border Buddy by Quill On is essentially a system of “towers” which are molded into shapes formed from different levels that increase in size. It allows the quiller to wrap quilling strips around the shape and size of their choice to make an open triangle, circle or whatever you need for your project. There is also a handle that fits inside of the towers for easier turning. The set I have is called the Ultimate Border Buddy, which has 7 shapes, as opposed to the original set which only has square, circle and triangle towers. The first thing I noticed about the Border Buddy is how well it was packaged. The box was very easy to open so I didn’t have to rip or tear into it. That made it very easy for me to pack all the pieces back inside when it was time to store it again. There’s also a fun note on one of the inside flaps asking customers to share their Border Buddy creations on their Facebook page for a chance to win a free gift! Check it out for some extra quilling inspiration! I was also really surprised at how large the towers are. The shapes are about 5″ tall, and when placed on the handle, they are 8″ total. The shapes included in my set are a circle, triangle, teardrop, square, rectangle, oval, and pentagon. 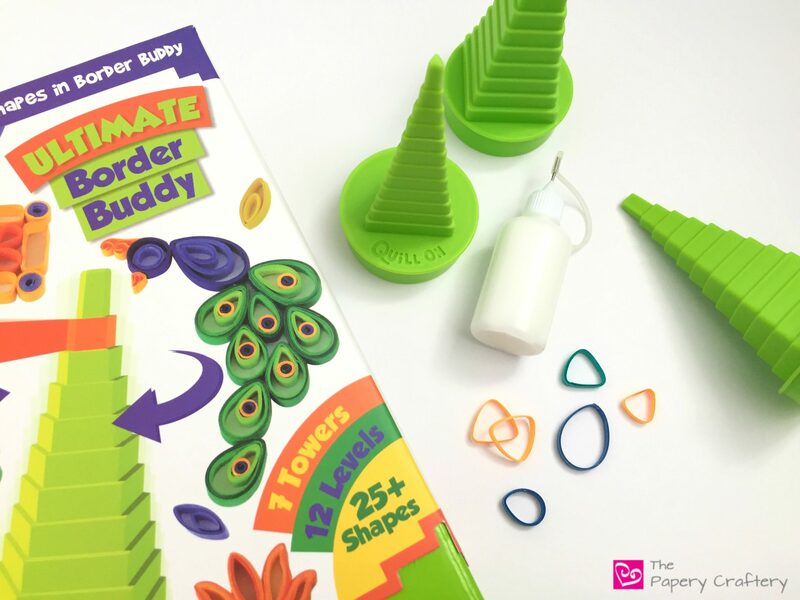 The only directions included in this Border Buddy set are to wind a quilling strip around the size and shape you need, glue every once in a while to secure, and remove gently. Technically, yes, it is that easy. Wrapping the strips, gluing a bit, and taking the shape off the Border Buddy worked just fine. I did have some trouble in some places, though. I found that my quilling strips tended to move a bit while I was wrapping. But, if I used a dot of glue to keep the end in place on my first go around, my paper would stay so I could get a tighter wrap. I also found the smaller sizes much easier to work with than the larger ones. No matter which tower I was using, the largest sizes would gap and buckle, no matter how tightly I thought I was wrapping my strips. This problem would probably be fixed with more practice, though. I also think I should have used much more glue as I was wrapping. The smaller shapes came much easier to me. My paper wrapped around them much more smoothly and could make quite a few in a short period of time. I used some to make a simple chain of circles and triangles. To do this, coat your paper with some sort of sealant to set the shape (I chose a few quick brushes of Mod Podge). Once that dries, make a small slit in some of the shapes and join them together. The sealant will stop the shapes from unraveling. Use a dot of glue to reattach the ends that were cut. Bottom line is that the Border Buddy isn’t terribly difficult to use and does what it promised. It does help quillers make speedy shapes without having to use random molds from wooden dowels, jars, blocks, or whatever other household bits we have lying around. It’s sturdy, well-made, and reasonably priced. They’re available for purchase on the Quill On website. But the real question is should other quilling artist pick up a Border Buddy to have in their craft supply arsenal? The real answer: I’m just not sure. I know this could be helpful for jewelry makers and I could see it coming in handy for quilling mandala creators. But as for the quilling that I like to do… I can’t think of any real purpose that I could use it right now. I think I might have an idea starting to poke around at the corners of my mind and I’m just not seeing it clearly yet. Has anyone else tried the Border Buddy? What are your thoughts?